AMMONNEWS - In the Presence of Prime Minister Omar Razzaz, a USD 745.1 million Cash Transfer Agreement to Jordan’s treasury was signed today as part of the 2018 U.S. economic assistance program to Jordan. This year’s U.S. direct cash grant is a record high (it stood at USD 475 million last year). 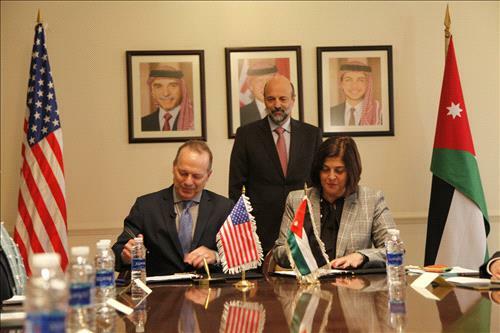 The grant agreement was signed by Minister of Planning and International Cooperation Mary Kawar and Charge d'Affaires of the U.S. Embassy in Amman Jim Barnhart. The grant will be used to support priority development projects listed in the General Budget Law 2018, which will contribute to reducing the budget deficit. The value of this grant is expected to be transferred to the treasury account before the end of the year. The remaining USD 335 million of economic assistance will be used to support economic development, improve the quality of the social sector, and enhance democratic accountability. This brings the total non-military U.S. economic assistance to Jordan in 2018 to around USD 1.08 billion allocated by the U.S. Congress to the Kingdom within the U.S. budget for the fiscal year 2018. The total figure signals an increase of about USD 330 million from the indicative value of economic assistance referred to in the memorandum of understanding governing the U.S. assistance to the Kingdom for the 2018-2022 period, signed between the two sides in February. The Minister expressed appreciation on behalf of the people of the Hashemite Kingdom of Jordan to the government and people of the U.S. for their continued and increasing support to the Kingdom, effectively contributing to the fulfillment of Jordan’s national development goals. She said this support and the agreement reflect the advanced relations between the two sides and the strategic partnership governing this relation. Razzaz said the support also reflects the efforts exerted by His Majesty King Abdullah bin Al Hussein to reinforce cooperation with the U.S.
Kawar said this support has had a clear impact on Jordan’s development march across different sectors. She reiterated Jordan’s keenness to tap more cooperation with the U.S. on different levels and in different domains, citing the significant impact it will have on the implementation of national reform and development plans and programs. Charge d'Affaires of the U.S. Embassy in Amman Jim Barnhart said the U.S. and the Hashemite Kingdom of Jordan maintain a long-standing partnership to support economic stability, strengthen democratic governance, and improve essential service delivery to meet the needs of the people of Jordan. Together, the U.S. and Jordan provided more than two million people access to fresh water and sanitation services and facilitated more than USD 2 billion in domestic and foreign investment in Jordan's renewable energy sector. Bilateral trade has increased by 800 percent following Jordan’s accession to the World Trade Organization and the implementation of the U.S.-Jordan Free Trade Agreement. Maternal mortality has fallen more than 50 percent since 1997, and more than one million children have access to improved learning environments in public schools through upgraded infrastructure and better teaching. The U.S. economic assistance program to Jordan is the largest in the world. The U.S. government, through USAID, has provided foreign assistance from the American people to Jordan for more than 60 years.